I hope, like me, that came out like the voice of Bruce, the shark, from Finding Nemo. To continue from my last post, I have been really obsessing on this behaviour economics stuff from Dan Ariely. Let me draw out a couple of behaviours and how they relate to what we have found in our survey and how it should impact on product and messaging. I do this purely in the name of example of how it can be used in all sorts of ways. Ariely loves to test these theories, effects and behaviours, so take a look at this chart. The experiment that lead to these results went like this … people who never created origami were asked to do it. In one case, they were given decent instructions, but their work – as expected – was not great. Another group was given less clear instructions and not surprisingly, their origami was even worse. Then, these creators were asked to evaluate how much they would pay for their own creations. Even though the “tougher to make” ones looked worse, those people would pay more for their creation. 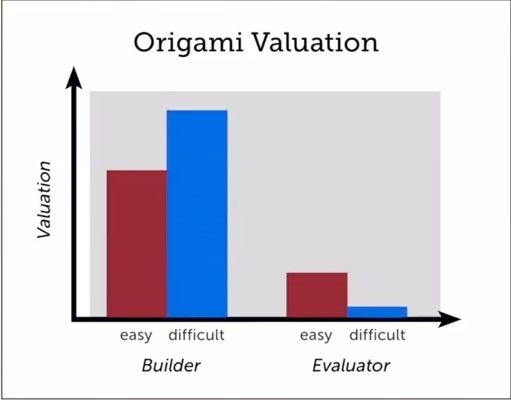 However, when another group of “evaluators” was asked what they would pay, they would obviously pay a lot less than the creators, but even less so for the origami that came from those with the less clear instructions. Pretty predictable when they had nothing invested. A similar effect to this is the “not invented here” effect. It goes hand-in-hand with the IKEA effect and anyone who has worked at any software company for more than a year could write a book of this one! So, how does this apply to travelabulous? I don’t mean to counter the last post where I said people like to take defaults, because that is also very clearly in play and we really have to nail the right default for the right users. However, another thing that we have clearly been learning is that people really do like the idea of travel planning. So much so in fact, that they (seemingly) contradict themselves in describing the travel planning experience. I believe (and we should validate) that this is related to the fact that people really want to put their own trip itineraries together – they want to create their own best trip. I could go on, but I think the point is fairly clear that even those who “enjoy” travel planning still have a hard time with it. Why is this? Again, we should validate this assumption, but I believe it is due to the IKEA effect. People really truly want to actively put together their own trips – to the level that many of them feel they already do when they contradict themselves on more direct questions. We have other primary data to support this theory already, but I will save that for another post. What are the learnings for travelabulous? Most importantly, we have to make sure that we don’t try to create a system that takes the fun out of planning travel – we don’t to create “auto packages.” We need to let people actively plan – just in a much more enjoyable way than today. It also impacts our messaging and the way we pitch. We have changed our tagline from “Your Online Personal Travel Concierge” to “Making Travel Planning as Much Fun as the Trip Itself.” Is this OK? You bet! We love the idea of travel planning too. We actual kinda like travel planning – we just want it to be easier. If I wanted it to “be done” for me, I would buy a prepackaged vacation or go to a travel agent – not that there is anything wrong with that – just not our market. What does it mean for other industries and ideas? A lot when you think about it. One last story and then you can think about how it applies to all sorts of things you may be doing. In the early days of cake mixes, they were wildly unsuccessful. Then they took out the milk and eggs from the dried packaging and made people add their own. Sales skyrocketed. People now had a sense of ownership and completion. Counter-intuitive? Maybe. Reality? Totally!